Sometimes I see people complain that there are no movies about "nice" people. Or that there are, but nice people really only show up in horror movies, where they can die in the first five minutes, or in thrillers, where they must struggle to survive, or in any other kind of movie where the niceness will be slowly stripped away like cheap wrapping paper, revealing the cardboard box of humanity underneath. Anyway, not a lot of nice people in movies, right? And it's true. For the most part, we don't see movies about nice people doing good things, unless they're from Hallmark or designed to make you cry about how nice they are and how horrible the world is to them. Nice people make for bad filmmaking. Why? Because nice people are boring. No, seriously. Nice people, people who make good choices and answer the phone politely and maybe go for a jog every once in a while or just help out their neighbors and bake pies and stuff - they're boring as hell. Nice people aren't in the movies because nice people, for better or worse, rarely do things that we particularly want to pay twelve dollars to see on a screen. Nice people are, let's face it, pretty freaking dull. You know what isn't dull? David O. Russell's American Hustle. It's not even a little bit dull, and I think we can easily say that this is related to the number of nice people in it. By which I mean, none. There aren't any good guys here. And it's wonderful. I mean, from a moral standpoint it's probably not so hot, but let's push that aside for a second. We'll come back to that. For now, just think about how much more fun it is when all your characters are pants-wettingly nuts and broken and unhappy and terrible. It's more fun. It's a lot more fun. 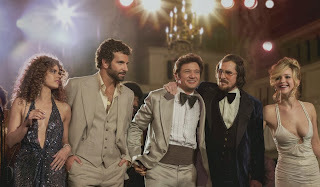 You don't get a movie like American Hustle with nice people in it. You just don't. But before we go any further, I should probably explain what the movie's about for those of you who haven't seen it. Which I generally assume most of you haven't. That's okay. You can watch it now. It's good. Trust me. SPOILERS for those of you who decided not to take my advice and go watch it now. Losers. The story, which is complicated and therefore being reduced to its lowest common denominator for the sake of my sanity, follows the events of the 1970s ABSCAM scandal, wherein about fifteen US Congressmen and Senators (and other officials) were caught in an FBI sting to find who was taking bribes. The movie is a largely fictionalized account of the real story, wherein an ambitious FBI agent, Richie DiMaso (Bradley Cooper and his perm) use two con artists, Irving Rosenfeld (Christian Bale) and Sydney Prosser (Amy Adams) to ensnare the mayor of Camden, New Jersey, Carmine Politano (Jeremy Renner), in a corruption scandal, and use him to get everyone else. It's okay if that was confusing. I'm pretty sure it's supposed to be confusing. If it isn't then it's doing an awfully good job of it anyways. The film is out of sequence, uses various different characters as voice over narrators, which is fun, because unreliable narrators are great, but also, again, confusing. And you can never really figure out who's conning whom, who loves whom, and what the crap is going on. In the process of showing the scam and the resulting fallout, the film gives us a wide eyed view of the world these characters inhabit, the people they know, and the ridiculous messes that are their lives. Irving is in love with Sydney, but tragically is married to Rosalyn (Jennifer Lawrence and her amazing tower of blonde curls). Rosalyn is a wreck of neuroses and manic episodes, who, though fascinating to watch, really isn's someone you'd want around your kids - and that's a problem because she actually has one. A kid, I mean. Rosalyn came into her marriage with Irving with a young son, Danny. Irving actually adores the kid, even going so far as to adopt him. It's fear of leaving Danny alone with his nutjob mother that keeps Irving in the marriage, even when he falls for Sydney and desperately wants out. Meanwhile, Sydney is having a bit of an identity crisis, living as an Englishwoman, Edith Greensley, and admitting to no one that Edith doesn't actually exist. She's furious with Irving for not leaving his wife yet, and also trying to maybe or maybe not get one over on DiMaso, the FBI agent effectively keeping them hostage. If they don't help with DiMaso's scheme, after all, he sends them to jail. If they do, hypothetically, they get off scot free. The tricky thing about the film is that there really are no good guys or bad guys. The protagonists are Irving and Sydney, but they're not traditional heroes in any sense of the word. These are con artists, plain and simple, and they make their living at the start of the film by preying on desperate people already in debt. They are vain, shallow, obsessed with themselves, and just generally pretty horrible. But then Richie DiMaso isn't some saint either. He's a gloryhound who refuses to keep his word, throws tantrums like a child, is obsessed with his self-image, and resorts to brutal beating of his boss when he can't get his way. He's terrifying and funny and pathetic all at once. The only character who can make a strong claim towards being at all "good" is actually the mark in all this, Mayor Carmine Politano. Because while Carmine is a bribe-taking politician with ties to the mafia, he's also a genuinely nice person. He likes people, he supports civil rights, he's a good mayor, he loves his wife. As Irving gets closer to Carmine through the scam, he becomes more and more convinced that Carmine is an innocent in this. He's just a good person with some bad methods. What Carmine wants, how they hook him, is his desire to see Atlantic City up and running again, restored to glory, and to bring lots of jobs and new industry to New Jersey. This would lower unemployment, raise property values, and just generally improve the quality of life. Carmine is a nice guy. He even buys a brand new microwave for Irving and Rosalyn because he's their friend and he wants to give them something nice. So obviously Carmine is the one who gets screwed. It's not quite that simple, of course. Carmine is a nice guy, but he's not a good one, precisely. He's willing to take bribes, to contact the mafia, and to coerce other politicians into taking bribes as well. It's for a good cause, sure, but these aren't exactly moral actions. Nice people make bad movies. Messy people, though. Messy people are the best stories. Because what's the point of the story, in the end? What makes a story worth telling? Change. The characters need to, in some way, recognize the reality of their situation and change it. It's not so interesting to see a nice person look at their life. I mean, what is there to change? But a messy person? There's lots to change there. There's room for redemption, for love, for conflict, for transformation. I mean, look at any great story. We love a redemption arc. Or, failing that, we at least love to see messy people realize their own messiness. And that's what happens here. This isn't a movie with a blissful happy ending. It's not a spoiler to tell you that. No one really walks off into the sunset as the set explodes behind them, and no one gets all that they want. It's even a bit sad. But the change that does happen? It's good. It's earned. It matters. Honestly, what more do you need from a movie? There are always likely to be nice and bad websites and fortunately, there are a few excellent movie sits. Learn more about zombies and horror movies on this site.